How are you coping with the summer ‘hotness’? I classify July and especially August as the still-air period in Milan. It becomes so humid and as a friend described, you would literally sweat for just lifting a finger. One of the shortcomings of living in Milan during summer is the inability to enjoy the seaside. As the weather now gets more humid and hot, I wish I could relocate to a house just by the seashore. But oh well, in my dreams. Some people, like me, are stuck in Milan due to work and will only have the chance to get away during the Ferragosto holiday or weekend. Our only respite right now is in tons of gelato and cold baths. If you want to have a quick day trip to a seaside town near Milan, you will find Car Sharing pools like BlaBlaCar and Train services like Frecciarossa helpful. They offer fast transportation options so you do not lose a lot of time commuting. Rimini in Emilia-Romagna region is well known for its shallow waters. It is the biggest beach resort on the Adriatic Sea. There are a lot of hotels located near the beach. For the privatized areas you have to pay to access, but there is also the public space. The nightlife here is very vibrant. Genoa or Genova and Savona are both in the Liguria region – the northwest of Italy. The unpleasant feeling of the stones by the shore is what makes some people shy away from the beach. You have to pay extra care so you do not cut your feet. Once you dive in, you soon forget the discomfort with the help of the soothing feel of the water and just relax. The colourful buildings that seem to be cascading down the hills and the untamed beauty of the city is what has won the hearts of many, and even mine. Cinque Terre means Five Lands. 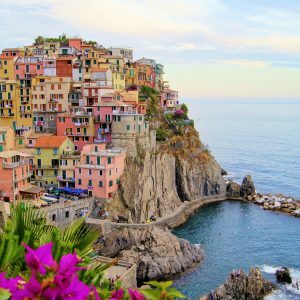 Hence it comprises five small coastal villages of Riomaggiore, Manarola, Corniglia, Vernazza, and Monterosso. My survival tip at the moment is staying hydrated. I always have a bottle of Aqua frizzante (sparkling water) on my desk I sip at intervals.